Join us on Thursday, January 31, 2019 at 12:30 P.M in the North Academic Center (NAC). Dr. Cooper will be giving a talk title High Blood Pressure in African Descent- Chasing the Phantom of Race. 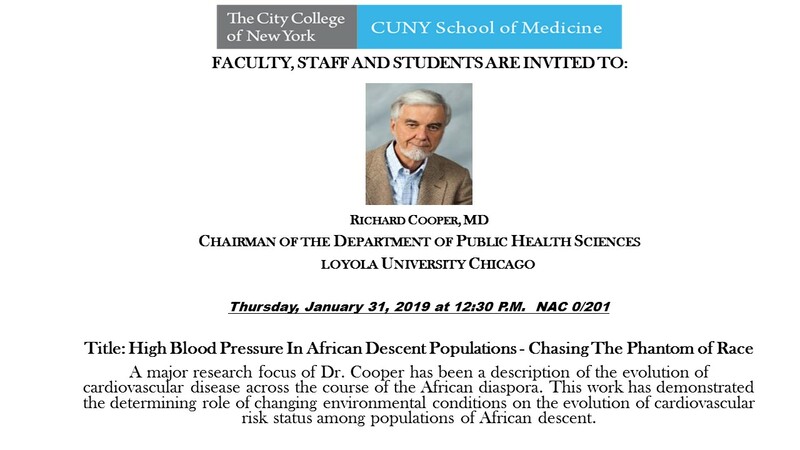 A major research focus of Dr. Cooper has been a description of the evolution of cardiovascular disease across the course of the African diaspora. This work has demonstrated the determining role of changing environmental conditions on the evolution of cardiovascular risk status among populations of African descent.